Macanudo Hyde Park Cafe delivers smooth, mellow, and classic flavor in a 5 1/2 x 49 Rothschild vitola. Good mild smoke with a hint of herbs. Not much more. Consistent burn with a strong ash. Classic Macanudo construction. One of my first cigars. Mild and a very pleasant draw with very good consistent construction. Recommended for any cigar smoker, seasoned or new. Excellent flavor,smooth taste,even draw, mild and good value.. This is the cigar I bought consistently when I started smoking cigars on a regular basis about 10 years ago. It is smooth, draws well and is a mild smoke. I still purchase them from time to time because they are so good. The best I found so far. I have tried many brands of cigars. the smoothness,flavor, burn, relative cost make it my choice for an enjoyable smoking experience. a pleasant and satisfying experience. Consistent is the one word that best describes the Hyde Park. Consistent is its construction and appearance, The flavor is enhanced by the gentle burn. Complexity does not need to be complex. The Hyde Park fits all my wants in a good smoke. Macanudo never disappoints. Fine smokebfor every occasion. 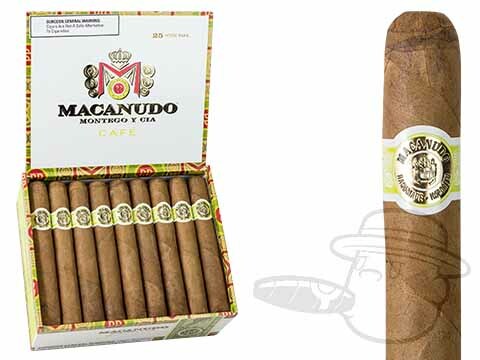 The difference in all the varieties of Macanudo cigars are exceptional and is my personal favorites. Quality cigar, slightly less expensive, but still a great smoke. One of the best cigars I've ever had. Great mild smoke and even burn. Pleasnt cugar - nice size for me. The original smooth creamy smokes. Macanudo Hyde Park Cafe has been my go to for years. Every now and then I venture to other brands and have even found some good smokes. But, I always come home to my go to. I have looked over the internet for sales, but Best Cigar Prices seems to maintain its edge as a Best Buy. I’m staying with my Mac’s for a good while. Macanudo Hyde Park Cafe is rated 4.3 out of 5 based on 23 customer ratings.